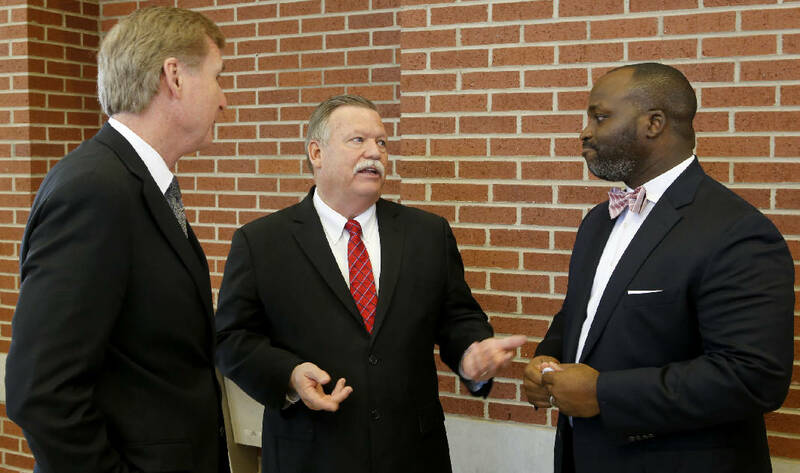 University of Tennessee at Chattanooga Chancellor Steven Angle, left, Hamilton County Mayor Jim Coppinger and Superintendent Bryan Johnson mingle after a press conference announcing the launch of the Future Ready Institutes at Howard School on Thursday, March 15, 2018 in Chattanooga, Tenn. The 11 Hamilton County schools to have a Future Ready Institute are: Brainerd High, East Hamilton Middle/High, East Ridge High, Hixson High, Howard High, Ooltewah High, Red Bank High, Sequoyah High, Tyner High, Signal Mountain Middle/High and Soddy-Daisy High. Hamilton County Schools is launching its Future Ready Institutes — small, career-themed learning communities embedded in the district's traditional high schools. Here's what you need to know about this unprecedented effort the school system and local business partners are making to prepare students for life after high school. 1. What are the Future Ready Institutes? The Future Ready Institutes are small learning communities within 11 of the district's high schools. Each school can host more than one. The institutes will each be focused around one industry theme, such as health care, technology, engineering or advanced manufacturing. Teachers will plan the curriculum alongside industry partners, focused around the career and technical education at the core of each institute. The institutes will start with about 100 freshman students and grow each year until about 400 students across four grades are enrolled in each institute. 2. Who are the biggest donors and partners? The effort is a collaboration among Hamilton County Schools, Chattanooga 2.0 and several local businesses including Erlanger Health System and Unum. JP Morgan Chase was an early donor and "catalyst" after a grant from the financial services company funded half of the new director's salary. Tennessee College of Applied Technology, Chattanooga State Community College and the University of Tennessee at Chattanooga also are major players. The district also received a Diversity Innovation Grant from the state Department of Education that will help fund the teaching institute at Tyner Academy. 3. How much does this all cost? As of now, Superintendent Bryan Johnson said it hasn't cost the district much. HCDE has paid half of Future Ready Institute Director Blake Freeman's salary, with JP Morgan Chase picking up the rest. Erlanger Health System has committed to at least $50,000 a year for three years to fund an Erlanger staff member who will coordinate its relationship with the institutes, but will also fund lab equipment, student experiences and a simulation room located in the hospital. Unum pledged $100,000 for three years for teacher development opportunities. 4. What unique opportunities will students have at these institutes? Students at each institute will take core classes in four traditional subject areas — English, math, social studies and science, as well as career and technical education courses related to their institutes' theme. They will complete projects that span across their different classes and are inspired by industry and curriculum. Students will also be able to take dual enrollment classes, earn industry credentials and college credits. Business partners will provide mentors, job shadowing, internships and other experiences in real-life settings in the industry. 5. How do I sign my student up? Parents and families of current eighth-graders are invited to a district-wide information night at 6 p.m. Tuesday, April 17 at Unum, at 500 Walnut St., Chattanooga. Information nights are also planned for each Future Ready Institute school site. For more information, visit: www.hcde.org/futureready.